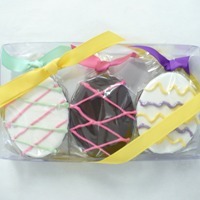 Your friends and family will eagerly hunt for these handcrafted Easter eggs, cut from our Simply Divine Brownie base, then dipped in either white chocolate or sweet dark chocolate and decorated for the season. Each confection is encased in a shell of cellophane and tied with a pastel ribbon. This trio of springtime designs is perfect for Easter baskets, dessert for a springtime luncheon, or a treat after dancing round the Maypole. Decoration: Fine dark chocolate, fine white chocolate, multi-colored pastel candy writers (sugar, palm kernel oil, cocoa, non-fat dry milk, dry whole milk, glyceryl lacto esters of fatty acid, salt, artificial coloring).